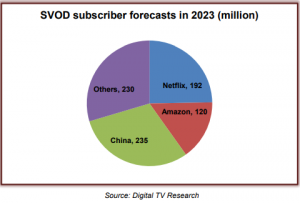 Global SVOD subscriptions are set to more than double between 2017 and 2023, with China taking over the top spot from the US next year, according to Digital TV Research. According to the research outfit’s latest Global SVOD forecasts report, SVOD subscriptions will increase by 409 million between 2017 and 2023 to total 777 million. Eleven countries will have more than 10 million SVOD subscriptions by that date. 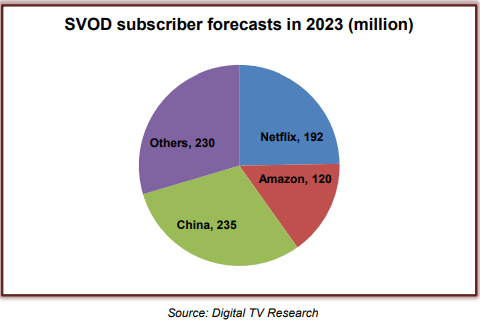 China will account for over half the world’s SVOD subscriptions by 2023, with 235 million subscribers, up from 97 million in 2017, according to the report. Digital TV Research predicts that China will take the number one spot among global markets next year, despite multiple subscriptions being common in the US. Netflix will account for 192 million subscriptions on the 2023 total, or 25%, with Amazon accounting for 120 million or 15%. China, where neither Amazon nor Netflix operate, will account for 30% of the global market, while other services will account for 30% of the market, according to the research outfit. Digital TV Research predicts that Netflix will add 82 million subscribers between 2017 and 2023. The report estimates that Amazon Prime Video will have 120 million subscribers by 2023, double its 2017 total, with the vast majority – 110 million – being in territories where the Amazon Prime shopping service is offered, with which the video service is bundled. Digital TV Research predicts that SVOD revenues will reach US$69 billion by 2023; up by nearly US$44 billion since 2017. The US will remain the SVOD revenue leader by a considerable distance – adding US$17 billion between 2017 and 2023 to take its total to US$29 billion, according to the report.